The last few weeks have been really busy. I´ve been doing a lot of fly fishing lately – summer above the arctic circle area is such a brief phenomenon that you really have to make the most it. Like last night, for example, when I caught the pretty 1,1 kg fattie above. We´ve gotten some pretty good Season 2 material on tape, too, as well as lots of other stuff that will be revealed in due time. But the main reason for writing this blog was to let you know that Fredrik and yours truly will be appearing on the very popular TV-show Sommeråpent on NRK1 (that´s Norway´s equivalent to BBC, roughly) tomorrow night. We´ve been invited to come and talk about Jazz & Fly Fishing in general and Season One in particular, and they´ll be showing some clips from the DVDs on the show. We´re really excited about this opportunity, as this will surely be a big boost for our following in Norway. Good times! If you have access to NRK1, tune in at 21.30, and you´ll see Fredzki and me making complete fools of ourselves on live TV. And don´t worry if you can´t receive NRK, it´ll probably find its way to the internet somehow. We´ll let you know. If last year was The Year of the Rat, this is truly the Year of the Worm. More on this later. Hi Guys. Good luck on your TV appearance. Watched House Hunters International in Tromso, Norway. Mighty cold looking. Anywhere near you? 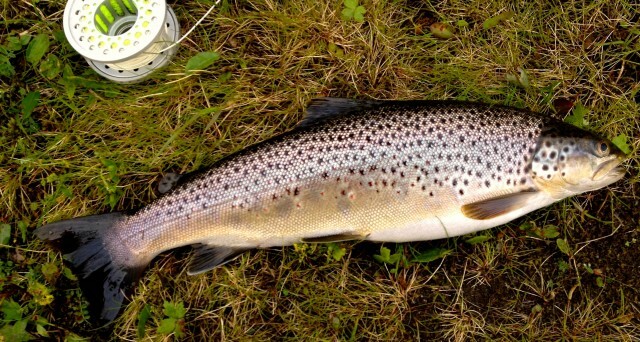 Nice trout Havard, was that another from the Upper Itchen? Great news about the TV interview will there be English subtitles? When does season One appear on Swedish television? Hope you had a good time on TV! I don’t have NRK so I haven’t seen it yet… Is there a link for a web TV or similar? Nice trout btw! Graham: No, that fish is from the mountains, above the treeline. Good fishing in the mountains now. Subtitles: we’re working on it!